Sensa is one of the most renowned brands when it comes to stone countertops, worktops, shower walls and other elements of the home. This brand guarantees the highest quality and standards; it is just a matter of choosing the right colour for your bathroom, kitchen or hallway. We have made a list of 10 stylish Sensa stone colours to help you decide which one is the best for you. This style has a white background with very fine silver veining. It is a classic choice that will never go out of fashion. It’s an excellent choice because with it you will not have to think about whether it’s in or not. Taj Mahal has a creamy background with fine golden veining. Paired with similarly toned cabinets it will give your kitchen or bathroom cosiness and warmth. This is a very unique style- it has a black background with white and gold lines that look like they are painted with a brush. The lines are very bold and this style is best used as an accent, on the kitchen island for example. This is another classic choice with whom it is hard to miss. It is a solid black, which will look gorgeous paired with lighter toned cabinets. Another very unusual style, it has white lines all over a black background that look like smeared paint. 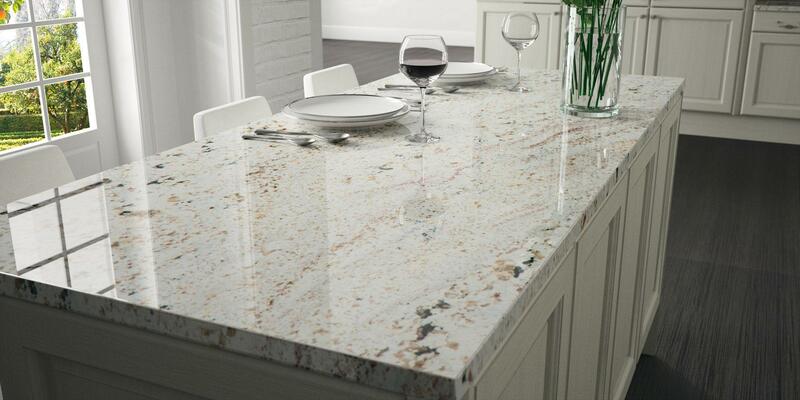 It can be used as an accent, but it will also look good as the main style for the whole countertops. Ice blue is a yellowy-beige with brownish lines that look like wooden branches. This style will look excellent in traditional style kitchens. This style is cool toned beige with brown glacial-like shapes. Its beauty will shine the most when paired with darker toned cabinets. This is a very classic choice- it is white with fine black dots scattered on its surface. It is appreciative for all sorts of combinations, with both light and dark toned cabinets. This unique style has a black background with distinct white veining that looks like stardust. It is very eye-catching and will make your kitchen island stand out like no other. This style is very unique because it has different colours mixed in it; it is a mix of light brown, grey and cream that blend perfectly into each other. This style will look gorgeous in monochromatic kitchens and bathrooms. Sensa stone is one of the safest choices for kitchen and bathroom countertops, not only for its quality but also because you can find very unique styles in its range. Ready for kitchen or bathroom renovation? Contact us and we will template, supply and install Sensa stone countertops, shower walls or backsplashes in just 7 days.